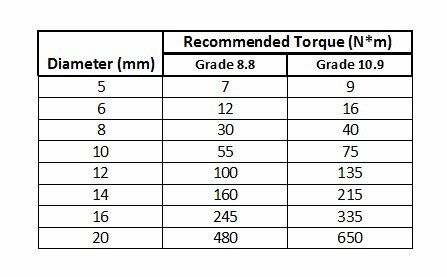 The maximum recommended torques given in the table below assume that the threads have been lightly oiled. Doing a bolt up to a specific torque should set the tension in the bolt to appeoximately 85% of the prrof load given in the table. You should only use these where the machine manufacturer has not specified a torque. Some manufacturers may specify a torque for their specific fasteners. Fine pitch nuts and bolts have different torque levels, and these should be shown on the manufacturers documentation. These are often used where a bolt is screwed into a soft metal block, such as aluminium casting, the thread in the block may be far weaker than the bolt and a lower torque is required to prevent stripping the threads. As well as where a bolt is screwed into a weak part, another important reason for reducing the torque setting of a nut and bolt is if the bolt is carrying other loads. When the bolts are tightened to join the flanges together, the tightening of the bolts pre-loads them, using up some of the strength to squeeze the flanges together. When the weight is picked up, the bolts ahve to carry the weight aswell. The weight is added to the pre-loads on the bolt. If the bolts are tightened to their maximum torque setting before the weight lifted, then most of their strength is used up in squeezing the flanges together and there may be too little strength left to support the weight.